Getecha has long since evolved from a specialist for the granulation of plastic waste to one of the leading suppliers of whole recycling lines, available in the UK from Labotek GB. However, at the core of these highly automated systems are always customers – and project-specifically optimised hoppers or infeed granulators from the RotoSchneider portfolio of the company. At this years’ Fakuma, the machine builder will present some of these customised system solutions for the granulation of production scraps from the injection moulding and blow moulding technology in Hall A3 as an example. “Individualisation has now become a central topic for our work in engineering and development. At this year’s Fakuma, we will demonstrate how such tailored solutions can look in practice based on current granulators”, says Burkhard Vogel, Managing Director of Getecha. For this purpose, the plant engineering company from Aschaffenburg in Germany will present its clean room granulator GRS 180 and GRS 300 at its stand 3210 in Hall A3. These remarkably slim beside-the-press and central granulators are designed for use in plastic technology production lines, which are subject to increased requirements of cleanliness and hygiene. They granulate up to 35 kg (GRS 180) or 80 kg (GRS 300) of material per hour, and hardly release any particles (<1,0 µm) due to integrated extraction equipment and special technical sealing solutions. Due to its low-height design, the GRS 180 (type A 5.10.9) has a total height of only 1,050 mm and can be easily positioned under drop chutes, separating drums or large injection moulding machines. Amongst others, an extremely flat special hopper forms the constructive basis for this innovative granulator design, in which an automatic dual slide valve system ensures feeding of sprues and scraps without splash back. Here, the gateway function can be designed appropriately in three different cycle versions by means of a toggle key and an integrated easy control. The hopper of the GRS 180 (type A 00246) at the Fakuma stand of Getecha is also equipped with this flexible gateway function. Here, loading can be performed for example with a sprue picker from the portfolio of Getecha. The feeding process including the gateway function is regulated by a higher control in this case. “This exhibit at our stand is thus also an illustrative example for integration of a hopper granulator into the automated system environment of a customer”, says Burkhard Vogel. The same applies to the third representative of this RotoSchneider series, which Getecha will show at the Fakuma: A GRS 300 (type A 00169) for material throughput (sprues, small parts) of up to 80 kg per hour. The RS 2404 B1 is designed for a significantly higher hourly throughput of up to 160 kg and can be seen at the stand of Getecha. It is a hopper granulator, which is specifically tailored to the use in blow moulding plants – the B in the product name is representative for this. Burkhard Vogel explains the technical special features of this exhibit: “At the customer’s request, this granulator was equipped with a stronger drive (now 7.5 kW), a segmented die-cast rotor with 3 x 2 rotor blades in offset arrangement as well as a super tangential housing feed. It is thus perfectly equipped for the granulation of large-volume blow-moulded parts like for example 5 litre bottles.” The fans integrated in the hopper thus cause an additional air flow in the grinding chamber and make sure that the spray arresters remain closed and no ground material splashing back can escape. Getecha will present its central granulator RS 45090 as a clearly visible eye-catcher at its Fakuma stand in Hall A3. 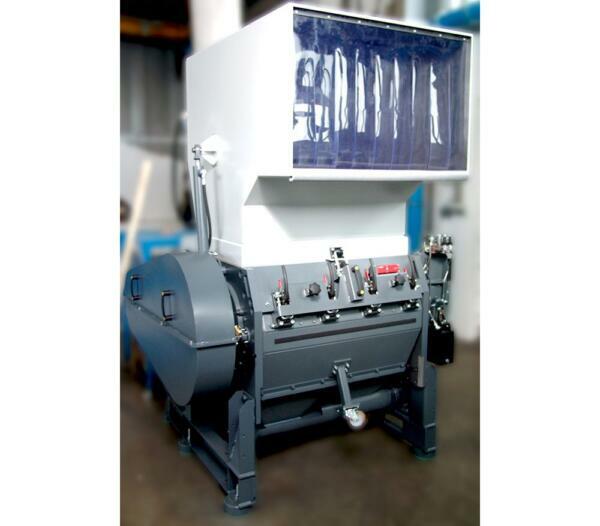 This powerful standard machine is suitable for throughput rates of up to 900 kg/h and works with a granulator housing which is characterised by very effective sound insulation. However, despite its additional insulation, it is very compact due to its drive, which is repositioned at the top and integrated into the housing, and only requires a small footprint. In Friedrichshafen, Getecha shows the RS 45090 with a feeder at the rear consisting of two rollers rotating in opposite directions for pulling in entire sheets, blanking skeletons and edge trims. “This means that the customer can feed foil from the unwind stand of the granulator as well as missing parts via the hopper”, Burkhard Vogel explains. Furthermore, visitors of the Fakuma exhibition will learn that this granulator can also be upgraded with a second bypass hopper attached to the side for feeding tubing and profiles as well as with a third bypass hopper for the plate material feed. Equipped like this, a single RS 45090 can cover the workload of three smaller granulators. In addition to the sturdy statics of the granulator, the basis for this performance capacity is its powerful 5-blade rotor and the usage of two stator blades in the grinding chamber. Not least, this granulator sets standards also with regards to maintenance: A hydraulic opening mechanism provides easy access to hopper and screen rocker, and an electrically monitored rotor locking guarantees maximum safety during routine blade changes. Founded in 1943, Labotek A/S has been a pioneer of high quality, cutting-edge solutions to the plastic industry since its inception. Today Labotek A/S is a leading provider of ancillary equipment, developed on the basis of the newest technologies and designed to reduce energy consumption to the absolute minimum. Whether the requirement is for a standard machine or a large bespoke implementation, Labotek project manage the whole process.